To those of you that are interested in fishing some of the Kona Fishing Tournaments in 2019, we are wide open for bookings this year and we have availability. With an El Nino developing we expect an awesome year. We have seen some big fish at the scales and the big ahi tuna are starting early. Below is the Tournament Schedule for 2019. Contact us to discuss and we can go from there. Please feel free to contact us about availability and information about these events. The Charter Desk is hosting their annual New Year’s Day Tournament! The Hawaii Big Game Fishing Club invites you to come join the fun and excitement of our 12th Annual Rock ‘n Reel Hawaiian Open! The Single Largest Marlin of the Tournament will be Winner Take All the purse from the Base Entry division. Entry fee to be posted soon. 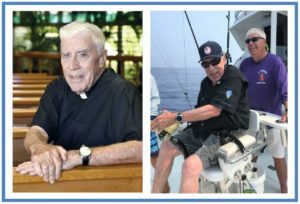 Five days of tournament fishing July 26th – August 2nd. Anglers and teams are invited to apply early as full tournament participation is anticipated. Log onto http://www.hibtfishing.com/ for details. The event that started it all off in 1986. The BIMT was the very first high stakes, big game tournament in Hawaii to pay a cash purse for tag and release. The base entry pays the top three largest marlin. 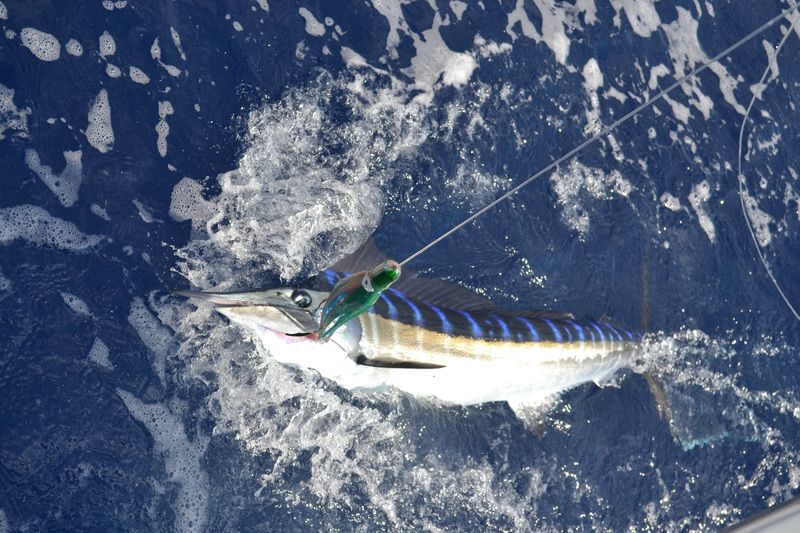 Optionals pay most points and largest marlin per day. Designed with input from the top skippers of 2010, minimum size fish is 400 lbs and 1st Place takes 70% of the base purse. Feel free to contact me about availability and information about these events. Five days of tournament fishing August 13-17. Anglers and teams are invited to apply early as full tournament participation is anticipated. 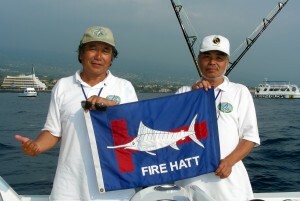 Log onto http://www.hibtfishing.com/ for details. September Challenge – September 12th, 13th, 14th & 15th. Mahi Mahi Fishing in Kona Hawaii is every bit as exciting as hooking into a Spearfish or Marlin especially if it is a big one! This one was! 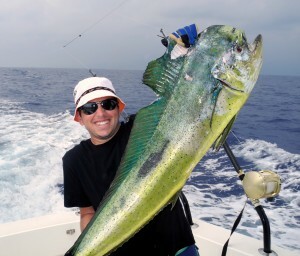 For Roy Small of Lancaster, PA this Mahi Mahi was one of the largest fish he had ever caught. A short while later we had a Blue Marlin strike that did not stick. Then about an hour later, another Marlin strike, again it did not stick. We intend to release them anyway, but it is still fun to walk them around first. 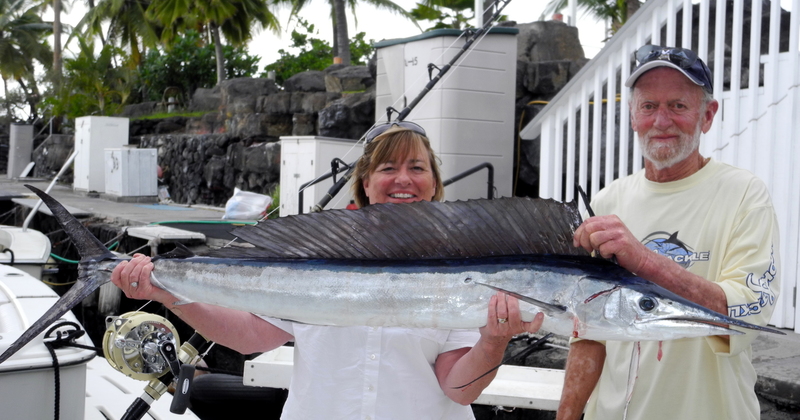 Today, Mahi Mahi fishing in Kona Hawaii proves to be luckier than Marlin Fishing In Kona. We start fishing the Hawaiian International Billfish Tournament this week and knowing where these Marlin are gives us a starting place for the tournament.